Live-blog from Fieldwork in Kalmykia! “Cultural revival in Europe’s only Buddhist region” by K. David Harrison is available online through the Nat Geo Explorers Journal. “During the past week the Enduring Voices team visited the Republic of Kalmykia, an obscure corner in European Russia, on the Caspian Sea. 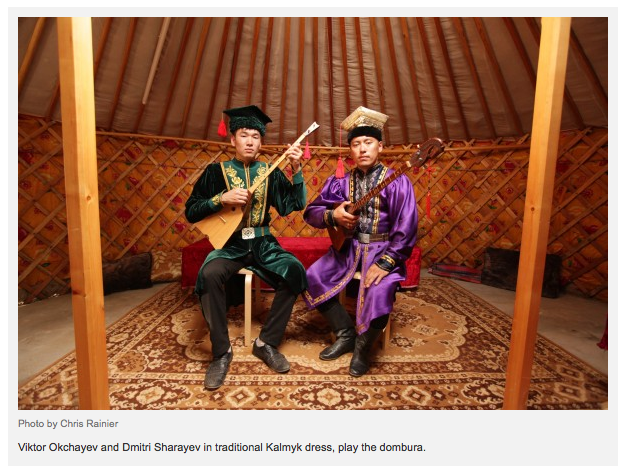 The Kalmyk people are of Mongol origin, having migrated to Europe from Mongolia at the turn of the 17th century. They experienced genocide and deportation in the 1940s under Stalin, and have struggled to keep their culture alive…” To read more, click here. This entry was posted in Endangered Language Activism, Enduring Voices Project, K. David Harrison, Language Hotspots, Media and Publicity, Support Endangered Languages and tagged buddhism, Dr. K. David Harrison, endangered languages, fieldwork, kalmykia, Language Hotspots, living tongues institute, minority languages, national geographic, The Linguists by livingtongues. Bookmark the permalink.